DNCE MM Spotlight New Song Nicki Minaj "Kissing Strangers"
DNCE has taken the world by storm. The multi-platinum selling band, which is made up of Joe Jonas on lead vocals, Jack Lawless on drums, JinJoo Lee on guitar and Cole Whittle on bass guitar, has found the recipe to being a rock group that makes electric pop music. Their hit "Cake By the Ocean" took the world by storm and people were absolutely obsessed with it, and it may surprise people to hear it was actually written in just ten minutes. 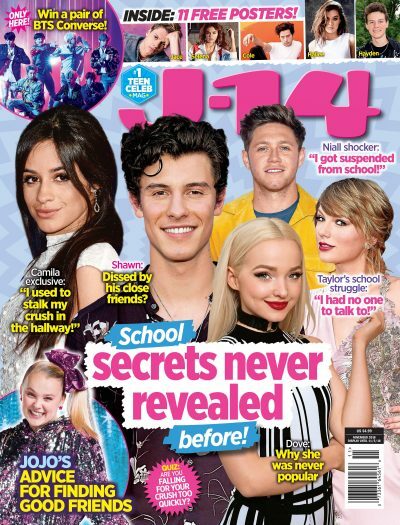 J-14 talked to the group before their M&M'S Spotlight show, a series of surprise concerts whose aim is to give fans a chance to live in the moment through music. The surprise concert series kicked off on April 12, 2017, in New York City with the foursome headlining the show. They told us all about their creative process when making a hit record, working with Nicki Minaj on their new song "Kissing Strangers," and what exactly is the formula for their success. "It is a really cool thing called M&M's Spotlight and it's a spontaneous concert, pop-up series and we are the first artist to do it and we can't wait. That's kind of our thing; spontaneity so we're going to come out and give a crazy candy filled show for the fans," Joe said. "We started talking to M&Ms we were like hey M&Ms we think you're a great candy and they were like well you know we are a cool candy but you guys are a cool band and we decided to do a big concert together." LOL. On making a hit record and having fans connect to it. "You can feel a certain amount of magic but you know you can't try too hard you just have to be creative and let what comes out of you creatively come out," Cole told us. "You know some songs that are written in 10 minutes like 'Cake By the Ocean' was and some songs you know take 10 years. We just take it day by day and stride by stride and live in the moment." "It's incredible. It's the greatest feeling. It's a small thing that started in your brain or your heart and all of a sudden it's invisible but real. It's tangible and it connects to people and it means something to them in their lives and if they take the time to come to their show and sing it back to you, that's true love." "We love our fans to death. They always show us lots of love even rain or shine. You know we just want everyone, even if they're not our fans, to feel like they can be themselves. Let their inhibitions go, insecurities go and just be exactly who they are and have fun and when they hear our music forget their problems and just let loose and smile. We like making people smile." "You know, we didn't have expectations. We wrote the song. We were excited about the music and the band and it just took off from there. Every day we wake up and are like 'oh my god we get to do what we love and play our music around the world for everyone.' 'Cake by the Ocean' really kicked the door in on the universe of DNCE and we just, we are so happy about it." "I think that's exactly what it is. It's that we're so different and we all balance each other out in different ways and we enjoy spending time with each other. We're each others family, friends, parents at times, little kids, whatever it may be. Individually we all have certain things we can encourage or bring to the table when it's time," Joe told J-14. "We're always together. If we have a day off we hang out. Even if we get to sleep for a night, in the morning we're like 'Oh man, I missed you it feels like a month since I saw you,'" Cole said. "We truly do everything together. In our time off it's more of the same. Just having fun and seeing the world." "We have a few. Backstage it's usually 30 minutes of playing loud music and bouncing around off the walls just trying to get excited and whatever we've been going through that day, whether it's ups or downs, we try to focus on having the best time and enjoying ourselves and giving the audience what they deserve." "I had a fan break into my tour bus and was sitting on the couch when I got in and she stood up and silently handed me a stack of photographs, probably about 30 different studio quality photographs of her pet skunk in a custom pimp my ride skunk go cart. That's all I'll say. She just wanted me to have them and I never heard from her again and I still have them." Joe told us: "It's featuring Nicki Minaj. It's a relatable song. It's got, I think, similarities and the addictiveness of 'Cake by the Ocean,' it is ear candy no pun intended. It is something I think we really are proud of and we want to be able to share with the world and we're ready so this weekend is going to be a celebration for all of us." As far as the fans reaction to that image of Joe and Nicki, the singer said: ""I think it was a great reaction and it captured the perfect moment." How was it working with Nicki? "Nicki's awesome. She's the coolest. She came in and we were fast friends and really took the time to get the video right and her verse is so awesome and I think it's really cool that she stepped into the rock and roll world for a minute with us. She has been nothing but supportive and she's excited about the song too," Cole said. Why is it so hard for people to connect to each other in 2017? "Probably the main reason you know even though we're all glued to our phones all the time, right? Sometimes you have to look up and be able to take things in and enjoy yourself." "It is good to listen. Most people are just talking and talking a talking but not really listening and I think it's good to be a listener," JinJoo told us. What is in store for the band this year? "This new song is just a song we wrote we were super excited about. We don't like to rest we don't like to take the time to reflect we just want to put out music and play shows. We're spontaneous we just want to see where everything goes and not think too much. Just keep our hearts and our minds open and keeping DNCE around forever." With that attitude and incredible drive to keep giving the world hit after hit, the band will be around for many years to come. Listen to DNCE's brand new song "Kissing Strangers" below.